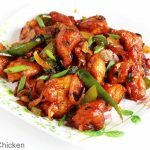 Chilli chicken recipe – Learn how to make chilli chicken gravy & dry restaurant style recipe with step by step photos. 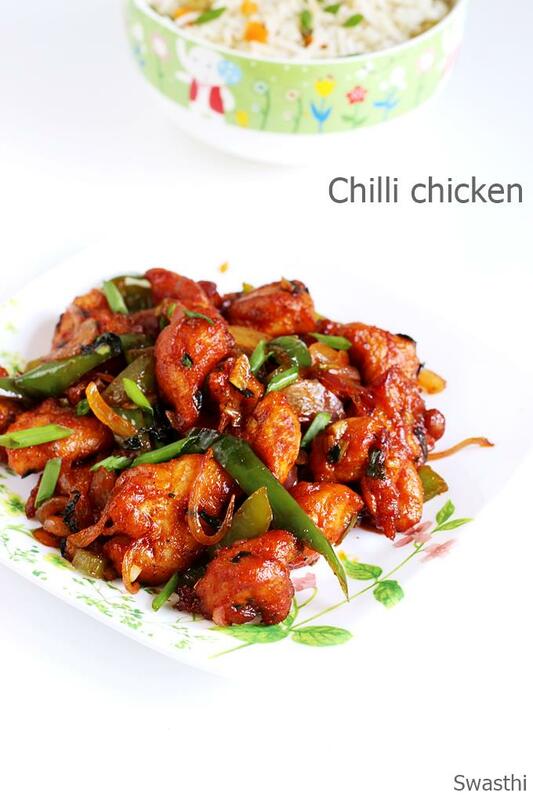 Chilli chicken is one of the most popular Indo-Chinese style chicken appetizer or starter that is served in Indo-Chinese restaurants. 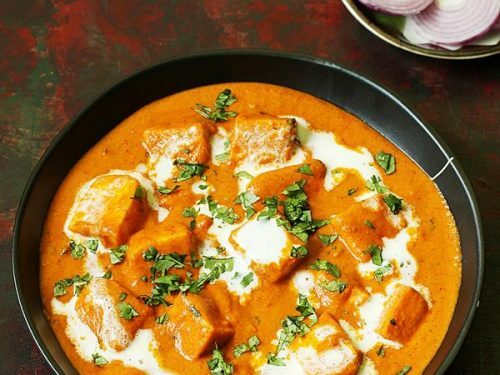 Vegetarian alternates are made with paneer, mushroom, potato and tofu. 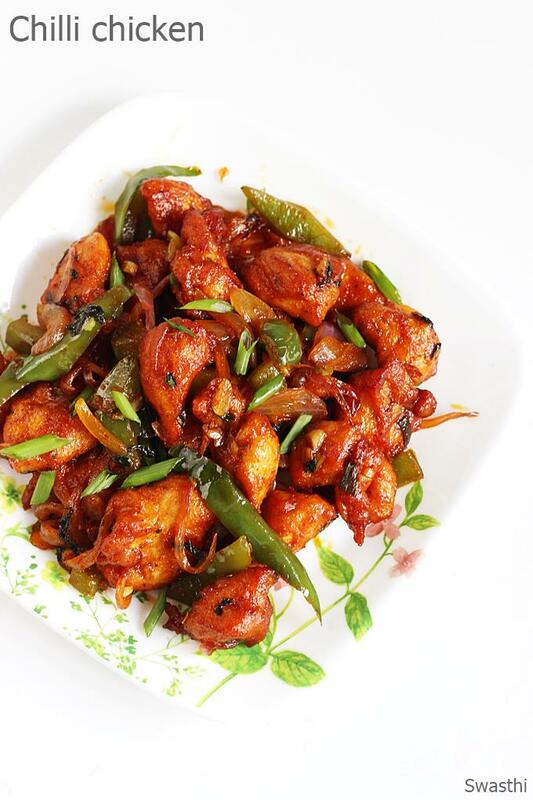 If you are new to Indo-chinese foods, then read on to know ..
Chilli chicken is a sweet, spicy & slightly sour crispy appetizer made with chicken, bell peppers, garlic, chilli sauce & soya sauce. This crisp fried saucy chilli chicken recipe is hands down the best that you can make at home. There are so many ways this chicken appetizer is made. 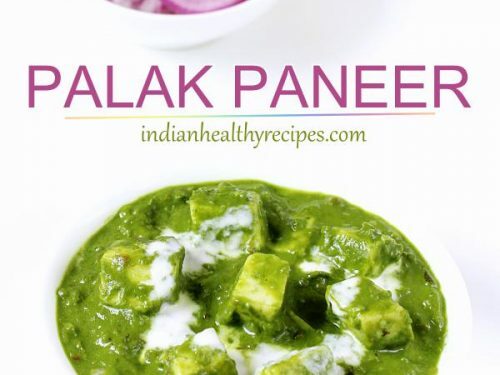 The recipe shared on this post is my own which has been much loved by my friends & family. To make the best Chinese chilli chicken, boneless cubes are marinated in soya sauce, chili sauce and pepper. Then deep fried until crisp. Later they are seasoned again in flavorful sauces. Is chilli chicken very spicy? Most people assume it to be too hot & spicy. It is not very spicy. 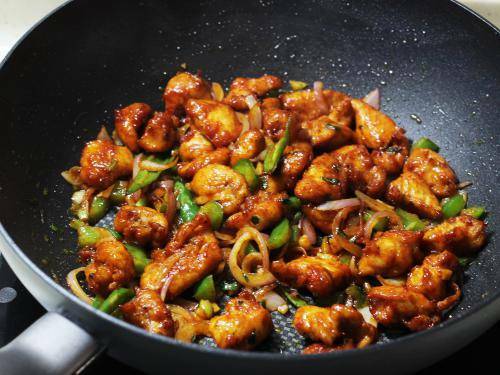 Chilli chicken has a right balance of sweet, spice & sour tastes. 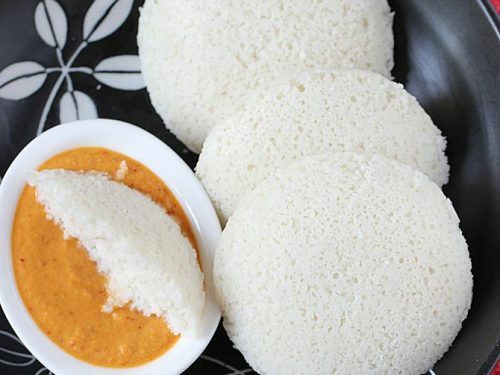 My young kids too enjoy this without any problem. You may reduce the spice levels by skipping green chilies. Usually in the restaurant made chinese chilli chicken, ajjinomotto or monosodium glutamate (MSG) is used to give a unique flavor to it. Trust me! you can still make the best with out it. Avoid it for health reasons, we don’t need it! Food color is also used to bring the deep red color, avoid that as well and just stick on to the best quality chilli powder or paprika for a vibrant color. The restaurant served appetizer most often makes us grease sick and tend to dehydrate a lot. For a healthier option you can shallow fry or grill the chicken, details mentioned in the instructions below. Try this at home! I am sure you will ditch the restaurants & make this best chilli chicken again. 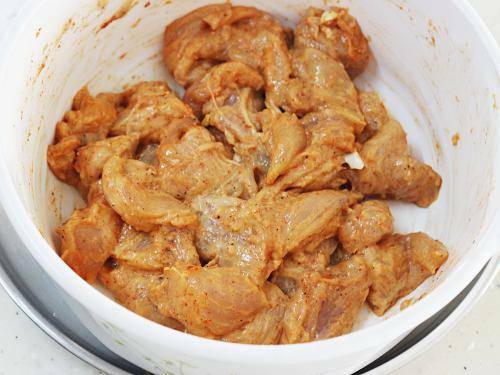 If you wish to brine the chicken first as they do in restaurants to yield tender juicy bites, please scroll down for brining tips. 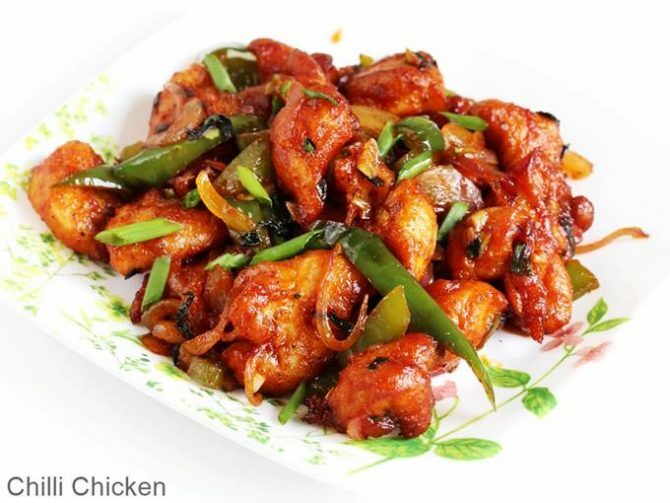 The best Indo chinese chilli chicken appetizer made with crisp fried chicken tossed in sweet sour & spicy chilli sauce. Pair it with hot stir fried noodles or fried rice. (Optional) To make the chicken juicy, succulent and to prevent from drying up you can brine the chicken following the instructions in recipe notes below. Marinate chicken with chilli sauce, soya sauce & pepper powder. Set aside until you prepare the rest. At least for 45 minutes. 2 hours is best. Meanwhile cube the onions, bell pepper and keep the sauce ready for seasoning. Sprinkle corn flour, plain flour, chilli powder on the chicken along with salt and mix well. Coat the chicken well. if the mixture is dry you can sprinkle little water or use half of an egg or only egg white. (refer notes) Mix well. Prepare the sauce in a bowl. Add soya sauce, chili sauce, red chili powder, vinegar and sugar to a bowl and mix well. Set this aside. 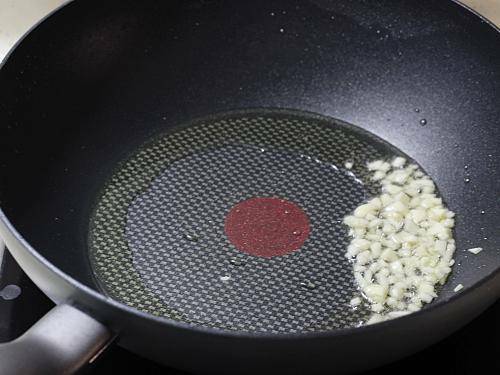 Heat oil in a pan for deep or shallow fry. It can also be grilled at 240 C for 20 to 25 minutes in a preheated oven. 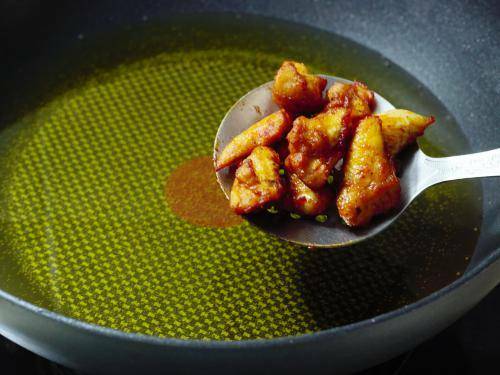 Check if the oil is hot enough by dropping a small quantity of batter to the hot oil. It must rise without browning. Now add the chicken cubes. Fry on a medium heat until crisp and evenly cooked from inside. Keep stirring to fry evenly. Do not over fry, it tends to turn hard. When the chicken is cooked completely, bubbles in the oil will begin to reduce. Drain on a kitchen tissue. Heat 1 tbsp oil in a wok or pan on a high flame. Add garlic & fry for about a min. 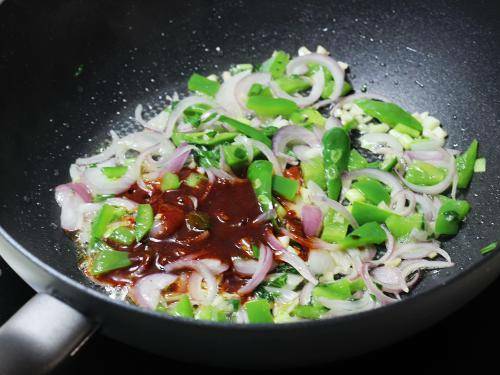 Then add onions, capsicum, spring onions & celery (optional) and green chilies. Fry till they turn slightly soft for about a minute or so. The veggies must still be crunchy. Pour the sauce. Let the sauces bubble up well. Taste the sauce and add more salt , spice or sauce as needed. Also taste the chicken and add accordingly. 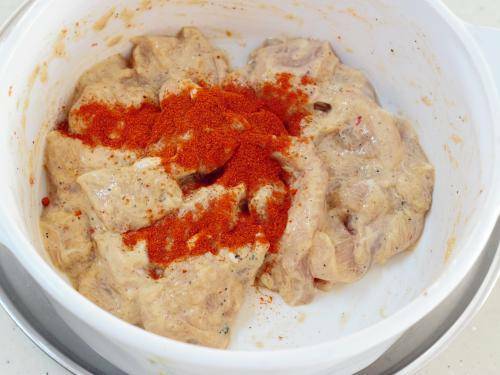 To make chilli chicken dry – If the mixture looks dry, sprinkle little water. Then add the fried chicken, Mix well. Saute on high flame for 1 to 2 minutes. To make chilli chicken gravy – just stir in 1 tsp corn flour with 1/3 to ½ cup water. Pour it to the pan and allow the sauce to thicken. You will need to add more chilli and soya sauce. Taste the sauce first and then add the chicken. Toss until the chicken is coated well with sauce. Serve chilli chicken hot as appetizer or with fried rice or noodles. 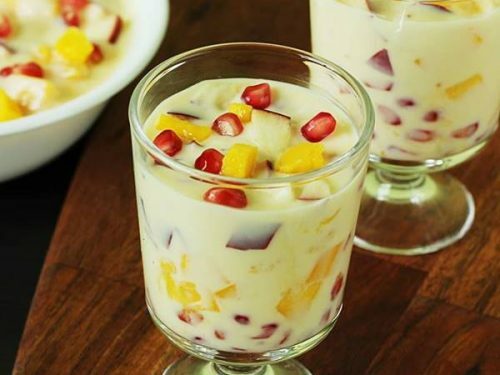 Mix together 3 tbsp yogurt with 2 cups of water and 1/4 tsp salt. Add the chicken to this and leave it for 45 mins to 1 hour. Brining in the fridge for 4 to 6 hours gives the best results. Drain the chicken completely & use in the recipe. This recipe uses more sauce. 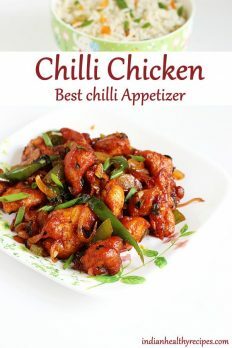 To make the best out of the chilli chicken recipe I suggest using kashmiri chili powder or paprika and saute well in the sauces on high flame which also lends a smoky flavor. 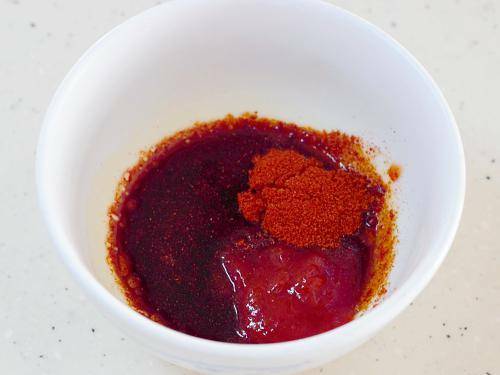 If you do not use enough chili powder, the final dish may not get a good color. So try adding more or less than mentioned in the recipe. 1. 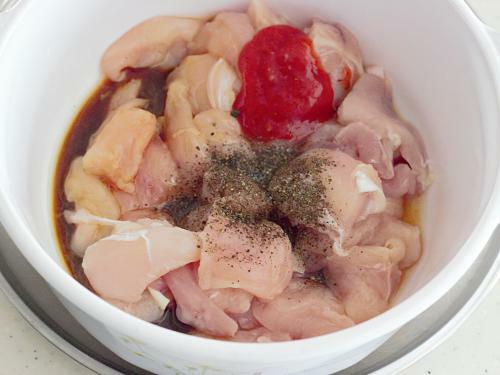 To a bowl, add 250 grams of cubed boneless chicken, 1 ½ to 2 tsp soya sauce, 1 ½ tsp chili sauce and ¼ tsp pepper powder. Marinate and set aside until you prepare the seasoning ingredients. If you have time you can leave it for 45 minutes. This helps the meat to absorb the flavors. 2. 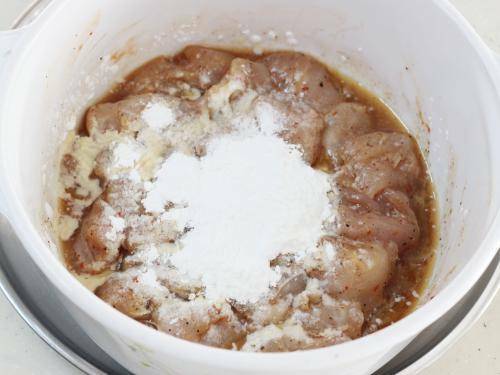 Sprinkle 2 tbsp cornflour, 2 tbsp plain flour if using and salt on the chicken. If you like to have a thick crunchy coating of the flour like we get in restaurants, add 1 tbsp more of plain flour and 1 tbsp more of corn flour. Mix well to coat. If the chicken is too dry, sprinkle little water and mix. 3. Add chilli powder or paprika and mix again. This helps to get a good color. This is optional. 4. This is how the chicken looks. 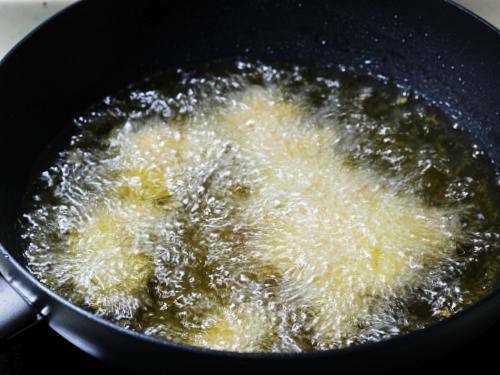 If you add too much water or make a batter, it will absorb lot of oil and will not turn crispy. 5. Heat oil until hot enough. Shallow fry or deep fry the pieces until golden. Drain off on the kitchen tissue. It can also be grilled in a preheated oven at 240 C for 20 to 25 minutes depending on the size of the pieces.You can as well put them on a skewer and grill. 6. Prepare the sauce for seasoning in a bowl. This way you will not end up using more sauces. Add 1 ½ tsp. soya sauce, ¾ to 1 tsp. vinegar, ½ tsp. sugar, ½ tsp. red chilli powder or paprika, 1 tsp chilli sauce or ketchup, ¼ tsp pepper powder (optional) to a bowl. I am using red chilli powder here again for the color. 7. Remove the oil to a bowl and Keep 2 tsps. Oil in the pan. Add garlic and fry for a minute. 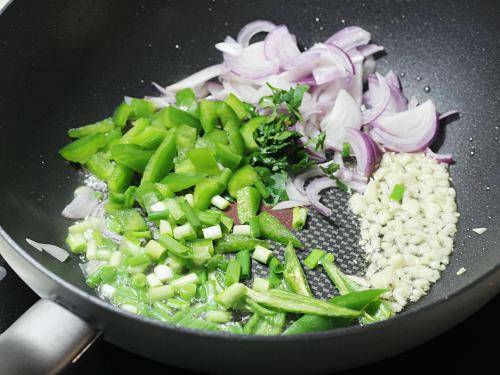 Add onions, green chilies, spring onions, celery and capsicum. Fry until they turn slightly tender. They must still keep the crunch. 8. Add the sauces and allow to bubble. If you feel it is dry, sprinkle little water. 9. Add the chicken and toss. Fry on high for 1 to 2 minutes till it looks dry. Serve chilli chicken hot as a appetizer. I would love to know what chili sauce you use, or an good sauce to start with in the UK. I make this weekly and I want to perfect it, we have a local restaurant who makes it so, so good. Bit darker and super tasty! Any sweet chilli sauce from brands like Heinz or maggie will go well. The darker color comes with the dark soya sauce. You can try it if you like the intense flavor of soya. Thank you so much. The dish came out well and my family enjoyed it. Just a question pls. What’s the difference between chilli Chicken and Chicken Manchurian please? Usually Manchurian uses mince chicken I believe. 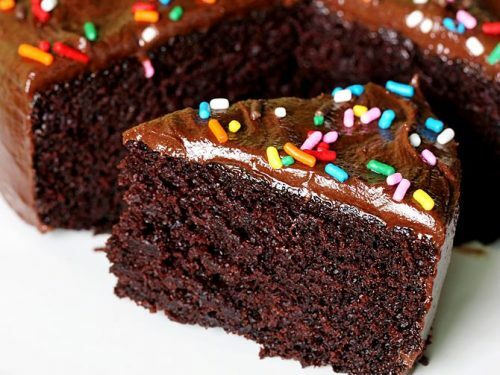 I just found out your website and it’s very promising and I think I can try out now following your recipies. I would just like to know how much time is required for frying the chickens in a chilli chicken recipe? I tried it out but the pieces became hard as it was overcooked. Could you please help. Thank you for your blog and hope to learn more in future. You are welcome. When the chicken is cooked, bubbles will reduce in the hot oil. This is one way to figure out. 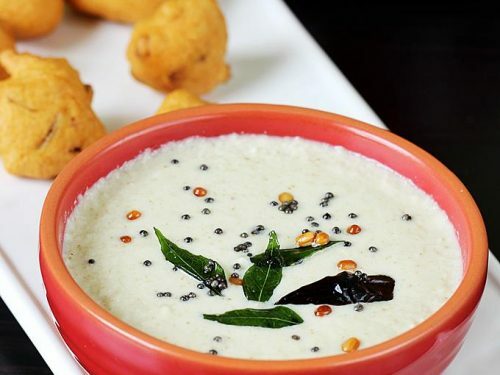 To get soft juicy tender chicken, you should brine the chicken first in curd or buttermilk. Please read the notes for details. Simple process. Thanks for ready to chili chicken and super recipe. Hi swasti….i saw this recipe of urs…n m final with this one….its my husbands 31st birthday n for d first time in our 8 year married life he asked me to cook him his favourite chillie chicken all d other time we usually ordered it from d resturant but this time m doomed….hope ur recipe helps me in a big way…. Thank you. Yes I am sure chilli chicken will turn out very good. My good wishes to both of you. Hi! I have made it. Everyone loved it. 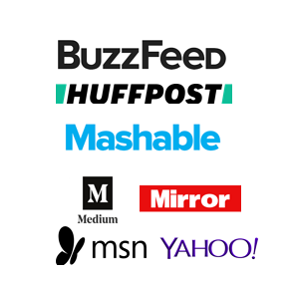 It would be nice to print them.